Fuel is the second-largest expense (next to depreciation) for fleet businesses — and it’s the most unpredictable expense as well. With market prices for fuel ebbing and flowing, fleet vehicles aging, and fleet drivers taking unexpected trips to McDonald’s or the mall, it’s hard to project what your fleet-wide fuel expense is going to be year over year. When it comes to fleet fuel expenses, you can only control what you can control. In this blog, Skypatrol will show you how taking control of driver behavior and using top-tier fleet management software can help your fleet save money on fuel. Fleet vehicle idling can cost up to $60 per month, per vehicle. 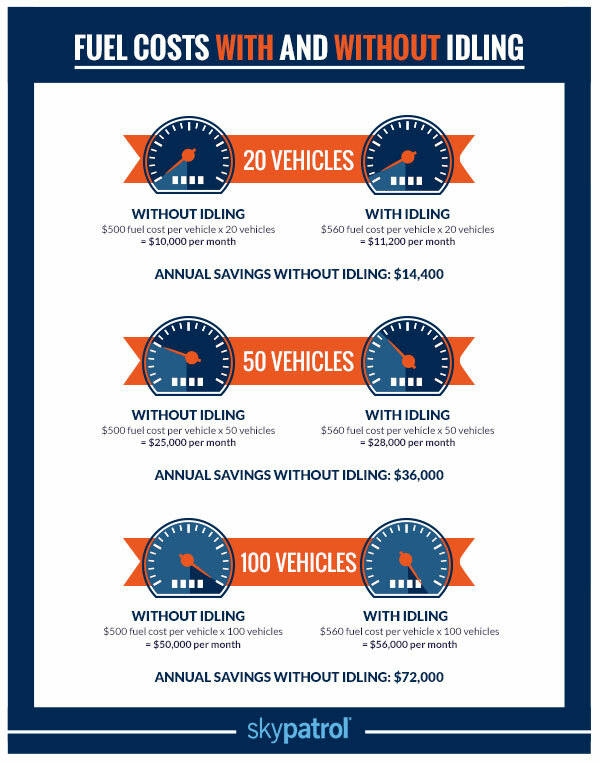 If you have 100 fleet vehicles, that’s $6,000 per month (and $72,000 per year) wasted on idling! While a stop or two en route to a job is perfectly normal, it’s the idle time in parking lots, in drive-thrus, or at delivery locations that can spike your fleet fuel costs. In the summertime, your drivers might spend 20 or 30 minutes each day sitting in a parking lot, blasting the air conditioner, and waiting for info on their next delivery or house call. The more work you can do to minimize this idle time and keep your employees at work, the less fuel costs will hurt your bottom line. When left to their own devices, fleet drivers will take stops at unauthorized locations and use fleet vehicles for personal business. According to Orion Fleet Intelligence, up to 84 percent of fleet drivers take company vehicles to their homes, fast food restaurants, or shopping centers. This doesn’t seem like a big deal if you’re looking at a single incident, but think about how many extra miles and extra fuel is used if every single fleet driver makes an unauthorized stop once a week. That’s a lot of money that should be going toward revenue generation and business growth, not personal trips. To minimize or eliminate unauthorized trips in fleet vehicles, take advantage of a fleet management system with GPS. Installing car GPS tracking devices in your fleet vehicles and overseeing driver behavior with fleet management software will help you hold your drivers accountable for unauthorized trips, and save you money on fuel expenses month over month. Once drivers know their routes are being tracked, they’ll have no choice but to avoid personal trips and stay on course. This leads to better driver behavior and lower fuel costs that can make your business more stable and productive than ever before. The life of a fleet manager is difficult — there are so many people, vehicles, and data points to oversee and manage. The more metrics you can automate and optimize within your business, the more success you will have. That’s where Fleet Command by Skypatrol can help. Using a seamless, web-based, Verizon-powered interface, Fleet Command allows you to track driver behavior and idle time, record and organize data on fuel expenses, and send automated alerts and updates when vehicles go off course or spend too much time idling. You’ll be more proactive in lowering fuel costs across your entire fleet, and you’ll have the data necessary to evaluate the current state of your fleet operations and make data-driven decisions that increase profits and make your business better. The time to save money on fuel is now — schedule a demo of Fleet Command today.